Okay, so there are two types of bad movies: the first are jumbled, terrible-dialogue-ridden box office monsters (Wolverine). And then there are films who aren’t even aware of the audience watching them; films who do not realize that people in the crowd are sleeping, making their grocery lists, and passing frustrated comments to their buddies nearby (all in one sitting). Skyline is this latter type of bad. Imagine Independence Day, with aliens coming to earth to kill all mankind and being chased by Will Smith, who knocks them out and utters witty one-liners. Skyline is not that film. Instead, you’re stuck with stupid, annoying, unbelievable schmucks and their stupid unbelievable relationships when aliens decide to attack. The schmucks hole up in their high rise condo, bickering and whining about what to do – for the entire film. Occasionally they see people outside fighting the aliens. In such cases, you’re seeing the movie you wish you were watching. You want to know the army men shooting rockets at glowy extra-terrestrials or follow the civilians organizing a resistance. But either due to budget constraints, poor writing, or both, they–and you–never get to leave. This is in contrast to the wonderful low-budget alien flick, Monsters, which features believable characters, a believable relationship, and just like Skyline, characters trying to keep out of sight of the monsters – yet proves immensely satisfying. Skyline bored the hell out of me (if you hadn’t gotten that by now) and its relatively short 90 minute length felt like an eternity. Even the film’s last second shift, which belonged in the equally bad Resident Evil film franchise, couldn’t save it. Don’t see it in cinemas, don’t rent it, don’t waste your time. 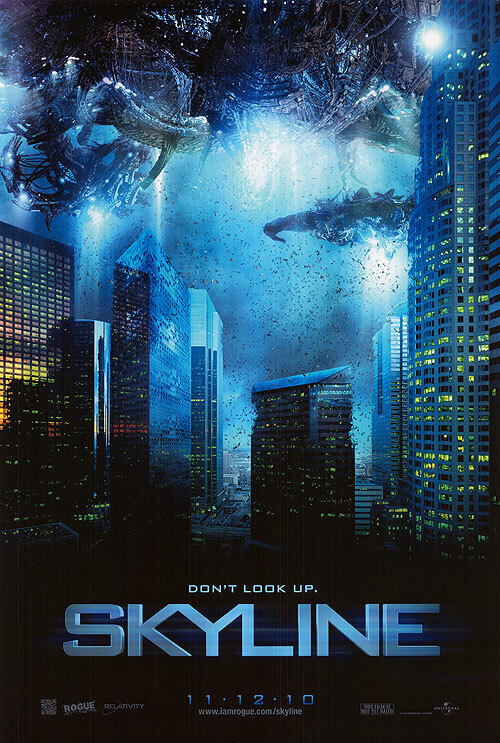 This entry was posted in Reviews and tagged Film, Indepence Day, Movies, Sci-Fi, Skyline. Bookmark the permalink. Thanks for the warning. You really have to wonder how a movie like this even gets made. I bet the directors showed off some of the special effects and were handed the money before anyone could think about what happens between alien appearances. If you look at the trailers for Skyline (poor name for a film. It makes me think of the Nissan car long before I think of the movie), this is exactly what happened.